Sometimes our students who have English as an additional language seem to be having more difficulty than expected developing their language, and accessing the rest of the curriculum. Most teachers have become more aware of the signs of dyslexia (and other specific learning differences), but the overlap with the language learning process makes it much more complex to identify EAL learners who also have a SpLD. It can also be difficult to persuade assessors to work with these students, as they often feel that until the learner has enough English to cope with the standardised tests, there is nothing they can do. However, there are some steps that teachers can take to check whether their gut feelings are correct about learners who seem to be experiencing difficulties. The first step might well be to put in place a systematic observation schedule, so that they and other staff members can keep a record of behavioural and cognitive indicators of dyslexia (or other SpLDs), which are not dependent on language proficiency. 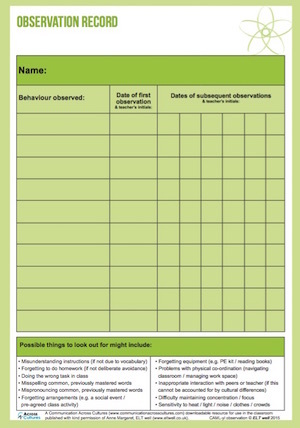 This is a simple chart on which the class teacher makes a note of behaviour that has caused some concern, and then records how often those behaviours are seen. Download your FREE observation chart: Click here! See other useful resources here. These behavioural differences could include issues around quick forgetting of information, or forgetting to bring PE kits or other equipment to class. It might be that a child takes a very long time to process instructions and get started on a task, or take longer to complete tasks than is expected. A teacher may notice that physical co-ordination and/or spatial awareness is a problem, perhaps in handwriting, articulation or navigating around the classroom or the school. There may be distinctive and unusual patterns of social interaction that mark the child as different, even from other pupils from the same cultural background. Once a teacher has made a note of any causes for concern, the chart can be shared with everybody who works with that student, so that they can also contribute their views and experiences of that pupil. This should include lunchtime supervisors, estates and catering staff, who may see the student in a different context, outside the classroom. After a few weeks, patterns may become clear about where and when these unusual behaviours are exhibited. There may be certain rooms in the school or certain subjects that trigger them, or they may appear across the curriculum and across the school. This would be a great starting point for a conversation with the pupil (and perhaps his/her parents or carers) about how best the school could support his/her learning. It may lead on to further assessment, or it may be that certain elements of the environment or the timetable are causing problems that can easily be resolved. In either case, it is important to reassure the student and the family that the aim is to support, not exclude, and that any personal information that is gathered will be used to inform interventions.